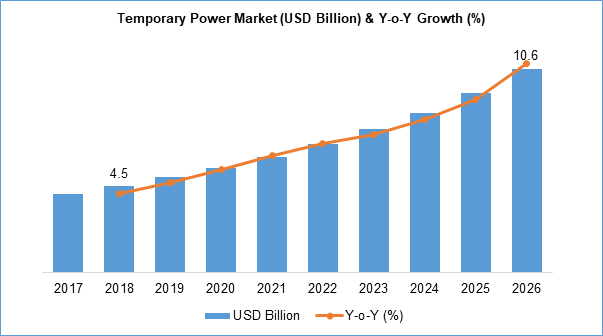 The global temporary power market was valued at $4.5 billion in 2018 and is anticipated to grow at a CAGR of 11.3% during the forecast period. Temporary power is the source of electric power that supports industries in times of power cut. Temporary power system supplies electricity on demand when the conventional source fails. The unpredictability of electricity supply and increased power cuts has increased the demand for market. Blackouts and power outage can be hazardous in places like hospitals, mines, and sewage treatment plants among others. The requirement of temporary power has been on rise due to developments like infrastructure and increased constructions, less power supply and a rise in planned events. The growing infrastructural activities, and rising power demand worldwide drive the growth of the temporary power market. The frequent blackouts and power outages, and increasing demand of power from hospitals, construction sites, and sewage treatment plants support the growth of the temporary power industry. The lack of power infrastructure, especially in the developing economies, has increased the demand for temporary power solutions. The increasing number of sports and corporate events further boosts the adoption of temporary power solutions. Other factors driving the market include lesser turnaround time, reducing cost of power generation, and technological advancements. Growing demand from emerging economies, growth in construction activities, and rapid urbanization and industrialization are factors expected to provide numerous growth opportunities in the temporary power industry during the forecast period. The global temporary power market is segmented on the basis of fuel type, power rating, end-user, and region. Based on fuel type, the temporary power industry is segmented into gas, diesel, and others. On the basis of power rating, the market is segmented into Less than 80 kW, 81 to 280 kW, and More than 280 kW. The demand for temporary power solutions with more than 280 kW power rating is increasing owing to high power demand manufacturing, oil & gas, utilities and mining sectors. On the basis of end-user, the temporary power industry is segmented into retail, healthcare, manufacturing, utilities, oil and gas, mining, and others. The utilities segment dominated the global market in 2018 owing to aging power grid infrastructure and lack of electricity supply in developing economies. 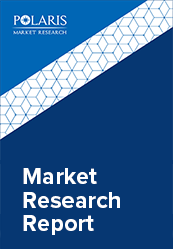 This temporary power market report comprises a detailed geographic distribution of the market across North America, Europe, Asia-Pacific, Latin America, and MEA. North America is further segmented into U.S., Canada, and Mexico. Europe is divided into Germany, UK, Italy, France, and Rest of Europe. Asia-Pacific is bifurcated into China, India, Japan, and Rest of Asia-Pacific. North America generated the highest revenue in the global temporary power market in 2018. The increasing demand for power supply, and growing applications in construction and utilities drive the temporary power market growth in the region. The leading players in the temporary power industry include Hertz Equipment Rental Corporation, Ashtead Group PLC, Speedy Hire PLC, Caterpillar, Inc, Atlas Copco CB, Smart Energy Solutions, Cummins, Inc, Aggreko PLC, Diamond Environmental Services, LLC, and Kohler Co., Inc among others. These leading players in the temporary power market are introducing innovative products in the market to cater to the consumers. Global players are entering new markets in developing regions to expand their customer base and strengthen presence in the global temporary power industry.